Our Raspberry Coffee Cake makes the perfect early morning wake me up, or ideal after dinner sweet treat. Filled with plump raspberries, cream cheese filling and topped off with a crunchy streusel topping that’s flavored with a touch of nutmeg and cardamom. It’s a bakery style coffee cake in your own kitchen! To top it all off you can whip up a 2 minute batch of decadent vanilla frosting (included in the recipe below). What types of fruit can I use to make Coffee Cake? A great question! Easily substitute any fruit that you have on hand. You can even use a combination of the above fruits if you want to get creative! Use the best butter you can buy: Great butter gives great flavor! It’s a coffee cake, and that means butter will be a prevalent flavor. The sides and bottom of the pan are brushed with butter, the batter itself has butter and the streusel topping has butter. It gives the cake its delicate crumb and rich flavor! No, we don’t eat it every day. But we always use a quality grass-fed butter, such as Kerry Gold (this is not an advertisement, just a suggestion). Buy the best you can. Precise measurements: I’ve said it before and I’ll most definitely mention it again. If you don’t have a scale then be sure to get one. Baking is a science, it’s literally precise measuring that gives great results. You’ll be amazed at the difference in the quality of your baked goods! If you are waiting for your scale to arrive 🙂 then use a spoon to scoop into your measuring cup, and then use the flat back of a butter knife to level it off. Cut With a Serrated Knife: Once your cake has cooled and you’ve unmolded it, use a serrated knife with long sawing movements to create neat pieces. 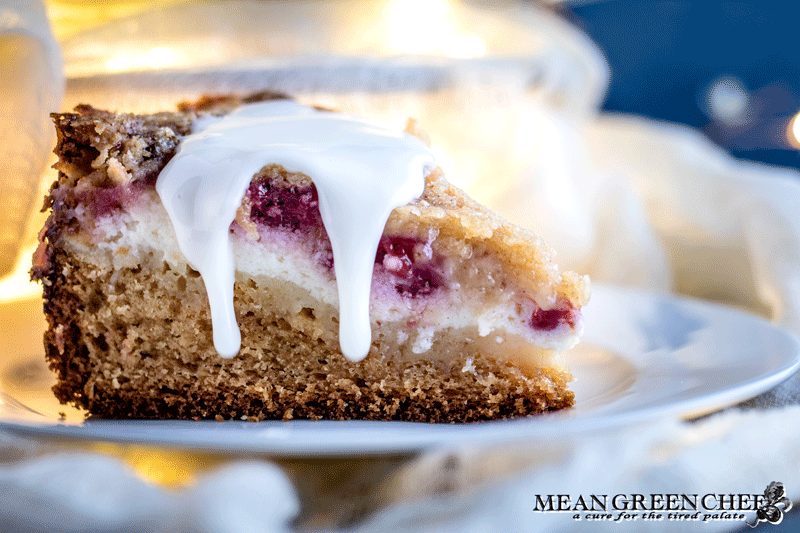 Our Raspberry Coffee Cake is filled with plump raspberries and a cream cheese filling and topped off with a crunchy streusel topping flavored with a touch of nutmeg and cardamom. 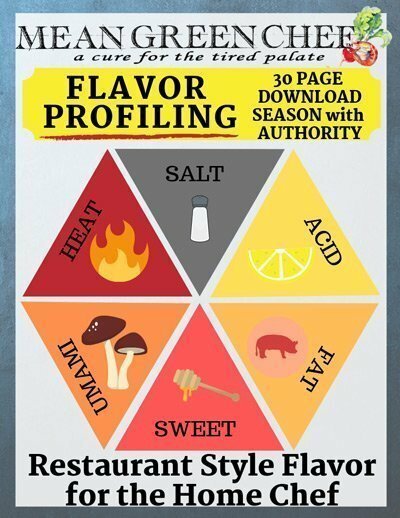 Preheat oven to 350°F/175°C. Grease a 9 i9-inch springform pan and line the bottom with parchment paper. Set aside. Beat together the cream cheese and sugar on medium-low speed until creamy. Add egg white end mix on low just to combine. Set aside. In a bowl stir together flour, baking powder, baking soda, and sea salt. Set aside. In a large bowl, cream together the butter and sugar on medium-low speed. Add egg and egg yolk and vanilla. Slowly mix in the flour mixture alternating with the Greek yogurt. Spread the cream cheese filling on top. Nestle the raspberries into the cream cheese filling. Set aside. Combine the sugar, flour, nutmeg, cardamom, and chilled butter into a food processor and blitz about 10 seconds for pea-sized crumbs. The streusel should resemble pea-sized crumbs after going through the food processor. Sprinkle the streusel on top of Raspberry Coffee Cake. Bake for 40-45 minutes until a cake tester inserted in the center comes out clean. Cool on a wire rack for 15 minutes, after cooling run a thin knife around the cake to loosen it from the springform pan. Whisk together the confectioners’ sugar with the milk and vanilla extract (or paste). Start by adding 2 Tablesppons of milk, if you want a thinner glaze then add more milk until the desired consistency is reached. Store on the counter up to 2 days at room temperature, tightly wrapped. Can also be stored in the fridge up to one week, sealed tightly with plastic wrap. If you’re looking for a few other great breakfast ideas, then be sure to check these out! We💙 LOVE 💚 seeing your creations! So don’t forget to tag us @meangreenchef or #meangreenchef so we can see what’s happening in your kitchen!